Experienced crafters have always been inclined to give handmade gifts, but in these tough economic times even novice crafters are trying their hand at giving gifts from the heart. One of the most treasured gifts to give or receive at any time is a mini scrapbook or memory album. In the past this might have meant using a small, standard scrapbook album and adding some meaningful photos. But today there are even more interesting and creative ways of giving the gift of memories. 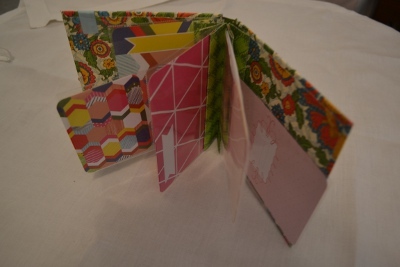 There are an amazing number of mini scrapbooks you can create yourself using standard scrapbooking papers and supplies. For example, imagine making a scrapbook out of paper lunch bags! These are quite popular and extremely charming. You can include pullouts for additional photographs and tags in the pockets created when making these scrapbooks. Another fun scrapbook album is the exploding box scrapbook. It looks like a little paper box, complete with lid. When you take the lid off a charming little scrapbook with several layers is waiting to be explored. Or how about a mini scrapbook made out of envelopes? Or one made out of shipping tags? Or CDs, or CD cases? There are several different ways you can incorporate the bones of a book from all of these items. Another popular mini album is the star book that looks like a star when it is opened up. Or open it the other way and it looks like a flower. And yes, you can add photos and journaling to these too. The square around, triangular around and circle around books are all basically the same, except they come in the obviously different shapes. These books, when opened up, open into sections or rooms where your photos are displayed. For the beginner, try a rubber band book or an accordion album. Both of these are very simple to make, yet once again when you add your photos and memory journaling they become absolutely cherished gifts. For the most experienced crafter, how about a tunnel book? These books are 3-dimensional in nature and quite the attention getters. There are so many fun album ideas out there including flip books, piano hinge books, library pocket books, flag books, Jacobs ladder books, and on and on. People love the uniqueness of these gifts, and once you add your photos and journaling, well, you just cannot go wrong.